On the evening of Wednesday, June 28, 2017, the Auschwitz Institute for Peace and Reconciliation (AIPR) launched its most recent addition the Sheri P. Rosenberg Policy Papers in Prevention series. 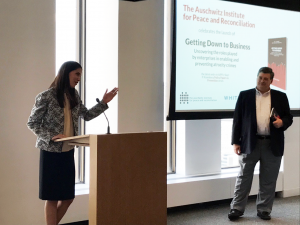 The second entry in the series, titled “Getting Down to Business: Uncovering the Roles Played by Enterprises in Enabling and Preventing Atrocity Crimes,” was written by Ms. Tatiana Gos, AIPR’s Academic Program Officer for Latin America. The paper works with existing and developing standards, research, and scholarship in the field of atrocity prevention and the growing domain of corporate human rights responsibility. While each of the two spheres have, until this point, developed rather independently of one another, “Getting Down to Business” takes a holistic approach to bridge the existing gap between them and forge links that allow for more effective and pragmatic analysis moving forward. Anchored in the framework provided by the Guiding Principles on Business and Human Rights, the paper is divided into thematic segments covering the obligations of States towards businesses and atrocity crimes prevention, the responsibility of enterprises to prevent atrocity crimes, and the role of international financial institutions in the prevention of atrocity crimes. 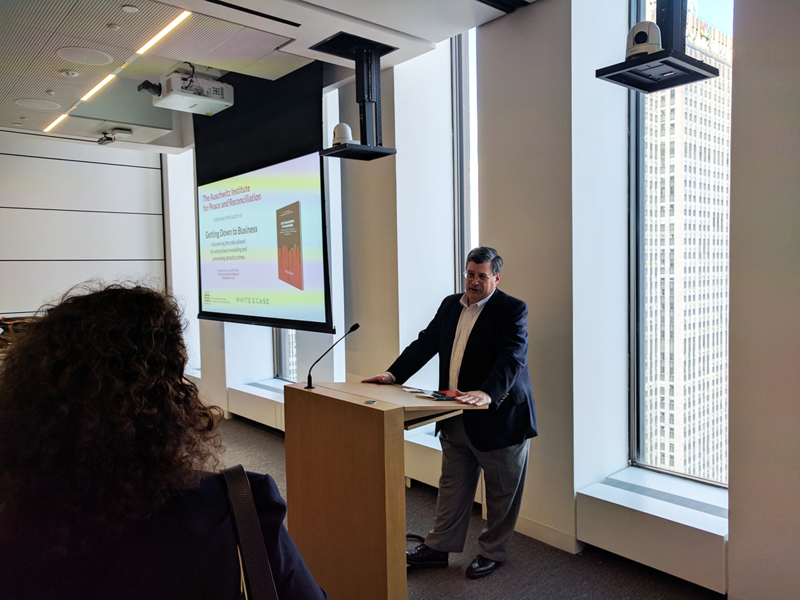 The launch event was hosted by White & Case LLP and began with an introduction by Dr. Tibi Galis, Executive Director of the Auschwitz Institute. 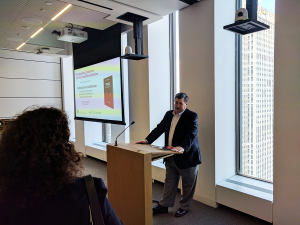 Dr. Galis introduced the paper and welcomed attendees to the launch. Representatives from a diverse range of governmental and non-governmental organizations were present, including those from Permanent Missions to the UN, foundations, state human rights institutions, and universities – as well as a number of participants in the recent summer institute on Large Scale Violence and Its Aftermaths. 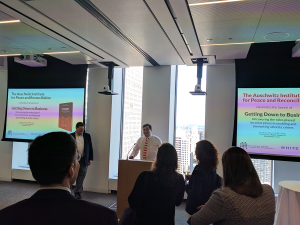 Mr. Owen Pell, President of AIPR’s Board of Directors and Partner at White & Case, followed Dr. Galis with commentary on the concepts introduced in, and discussed by, the paper and discussed the broader intersection of atrocity prevention and corporate human rights responsibilities. 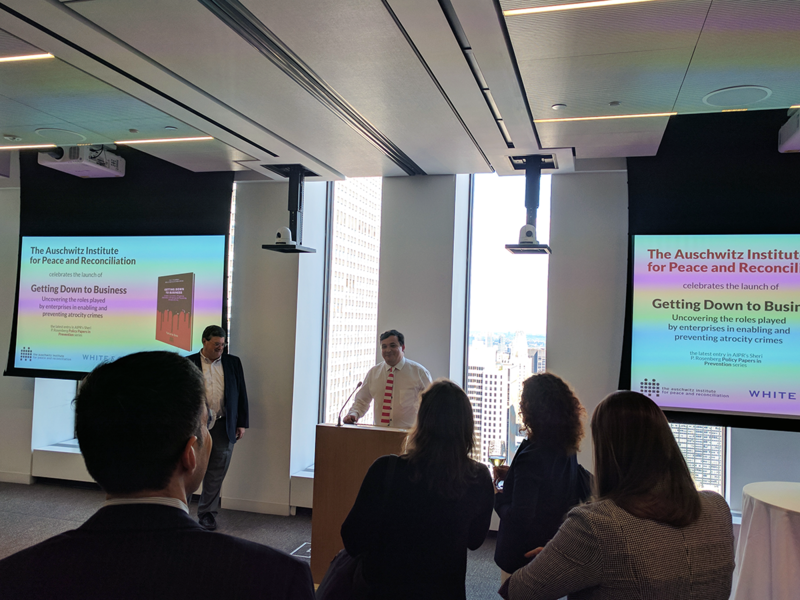 Mr. Pell identified the text as an important contribution to the burgeoning policy domain and pointed to the six case studies identified within as excellent starting point for future research. Concluding the event, Ms. Gos took to the podium to discuss her objectives in authoring the text and continued the thread of discussion begun by Mr. Pell regarding the ways in which the policy paper can be used as a tool to move the field of business-related atrocity prevention forward. In doing so, she highlighted the active nature of the burgeoning policy domain, pointing to the fact that advances in scholarship have been made even since her writing process began. An electronic copy of the paper is available in PDF format on our Publications page and has also been published by the Business and Human Rights Resource Centre on their website. For more information on this publication or future policy papers, please contact Rob Scharf at rob.scharf@auschwitzinstiute.org.